Summary: A large observational cohort study in Sweden found that women consuming more than 3 glasses of milk a day had almost twice the mortality over 20 years compared to those women consuming less than one glass a day. A large observational cohort study1 in Sweden found that women consuming more than 3 glasses of milk a day had almost twice the mortality over 20 years compared to those women consuming less than one glass a day. In addition, the high milkdrinkers did not have improved bone health. In fact, they had more fractures, particularly hip fractures. In observational studies both across countries and within single populations, higher dairy intake has been linked to increased risk of prostate cancer (cited in 2). Observational cohort studies have shown higher dairy intake is linked to higher ovarian cancer risk (cited in 2). Cow’s milk protein may play a role in triggering type 1 diabetes through a process called molecular mimicry3. Across countries, populations that consume more dairy have higher rates of multiple sclerosis4. In interventional animal experiments and human studies, dairy protein has been shown to increase IGF1 (Insulin-like Growth Factor1) levels. Increased levels of IGF1 has now been implicated in several cancers5. In interventional animal experiments6 and human experiments7, dairy protein has been shown to promote increased cholesterol levels (in the human studies and animal studies) and atherosclerosis (in animal studies). The primary milk protein (casein) promotes cancer initiated by a carcinogen in experimental animal studies8. D-galactose has been found to be pro-inflammatory and actually is given to create animal models of aging1. Higher milk intake is linked to acne 9. Milk intake has been implicated in constipation10 and ear infections (cited in 2). Milk is perhaps the most common self-reported food allergen in the world 11. 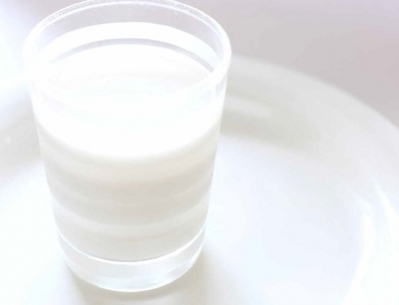 Much of the world’s population cannot adequately digest milk due to lactose intolerance. So despite being very pleased that the public is glimpsing some of the evidence against milk in this recent study, I think there is a far more powerful story; a story that takes into account the largely hidden context of diet and dairy research. There is a wealth of indirect evidence of very serious possible harms of consuming dairy foods, and, on the flip side, the evidence that milk prevents fractures is scant. As we look beyond the headlines, it is hard to think that we should continue to consume the lactation fluid that exists in nature to nourish and rapidly grow calves. 1. Michaelsson K, Wolk A, Langenskiold S, et al. Milk intake and risk of mortality and fractures in women and men: cohort studies. Bmj 2014;349:g6015. 2. Lanou AJ. Should dairy be recommended as part of a healthy vegetarian diet? Counterpoint. The American journal of clinical nutrition 2009;89:1638S42S. 3. DahlJorgensen K, Joner G, Hanssen KF. Relationship between cows’ milk consumption and incidence of IDDM in childhood. Diabetes Care 1991;14:10813. 4. Malosse D, Perron H, Sasco A, Seigneurin JM. Correlation between milk and dairy product consumption and multiple sclerosis prevalence: a worldwide study. Neuroepidemiology 1992;11:30412. 5. Key TJ. Diet, insulinlike growth factor1 and cancer risk. Proc Nutr Soc 2011:14. 6. Kritchevsky D. Dietary protein, cholesterol and atherosclerosis: a review of the early history. The Journal of nutrition 1995;125:589S93S. 7. Gardner CD, Messina M, Kiazand A, Morris JL, Franke AA. Effect of two types of soy milk and dairy milk on plasma lipids in hypercholesterolemic adults: a randomized trial. Journal of the American College of Nutrition 2007;26:66977. 8. Youngman LD, Campbell TC. Inhibition of aflatoxin B1induced gammaglutamyltranspeptidase positive (GGT+) hepatic preneoplastic foci and tumors by low protein diets: evidence that altered GGT+ foci indicate neoplastic potential. Carcinogenesis 1992;13:160713. 9. Spencer EH, Ferdowsian HR, Barnard ND. Diet and acne: a review of the evidence. Int J Dermatol 2009;48:33947. 10. Caffarelli C, Baldi F, Bendandi B, Calzone L, Marani M, Pasquinelli P. Cow’s milk protein allergy in children: a practical guide. Italian journal of pediatrics 2010;36:5. 11. Rona RJ, Keil T, Summers C, et al. The prevalence of food allergy: a metaanalysis. J Allergy Clin Immunol 2007;120:63846.